9 August 2007. Because it was Woman's Day, Mango Airline had a lucky draw for all the ladies on board the plane. We paid R652 for our two Mango Airlines tickets (infants travel free) from Cape Town to Johannesburg, which works out to R326 each. 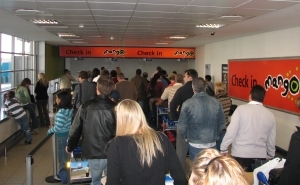 This compares to an average flight price (for the low cost carriers) from Cape Town to Johannesburg of R489 (this year, 2007) - of course the surveys are carried out on Friday evenings and we flew Thursday midday, so one would expect our ticket prices to be a bit less. With a baby on the lap it was a bit cramped for breastfeeding. 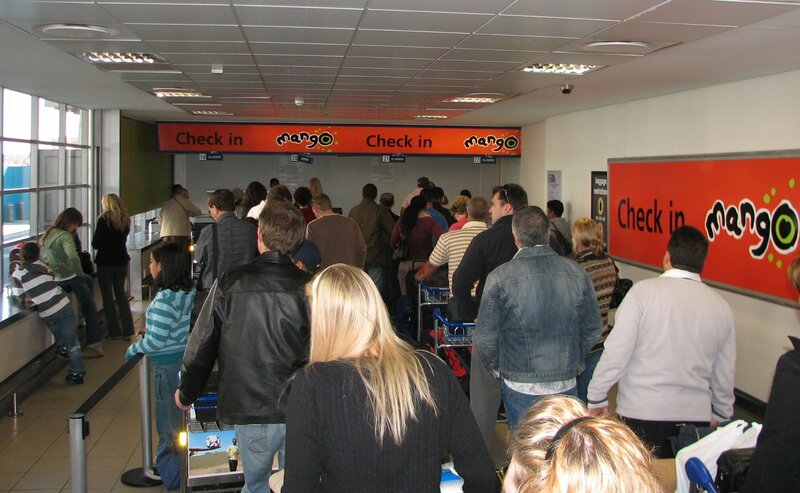 There was a short queue at the Mango Airlines check-in, in Cape Town. Although the flight was some 30 minutes late to take off, the pilot caught up some time in the air (of course this costs the airline and the atmosphere, as they have to burn extra fuel to travel faster). See our Mango flights from Cape Town to Johannesburg page, for full details on the flight route, and all flight reviews.